Posted June 29, 2018 by Staff Writer & filed under Arts & Entertainment, Theatre & Performance. Written by the great Italian composer Domenico Gaetano Maria Donizetti, Lucia di Lammermoor is a tragic tale of love and betrayal. The drama is driven by the forbidden love affair of Lucia (Jessica Pratt) and Edgardo di Ravenswood (Michael Fabiano), a sworn enemy of her family. When Lucia’s brother Enrico (Giorgio Caoduro) learns of the couple’s secret vows, he arranges a marriage between Lucia and another man. The emotional turmoil of losing her one true love is too much for Lucia to bear, causing her to lose her mind as well. As the mad Lucia, Pratt is insanely good. She has had her share of practice, having played the role of Lucia in 20 productions and 80 performances, and it certainly shows on stage. The music simply flows out of the soprano, who remains perfectly in character while hitting notes that would make most singers shift their emotional concentration. In the show’s famous “mad scene,” the singer is mesmerising as she manipulates her voice to become as fragile as Lucia’s mental state. Fabiano also has a notable performance as Lucia’s counterpart, but while the opera’s individual stars shine, the ensemble numbers threaten to steal the show. A well-rounded cast, the group effortlessly blends together, creating the haunting aura of the tragedy and displaying director John Doyle’s talent. 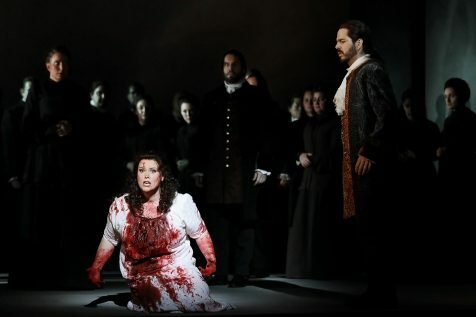 The lengthy standing ovation and multiple exclamations of “Bravo!” during the show demonstrated the quality of the production: Lucia di Lammermoor is simply sensational. Reviewed by Erika Echternach & Lili Sekkai.